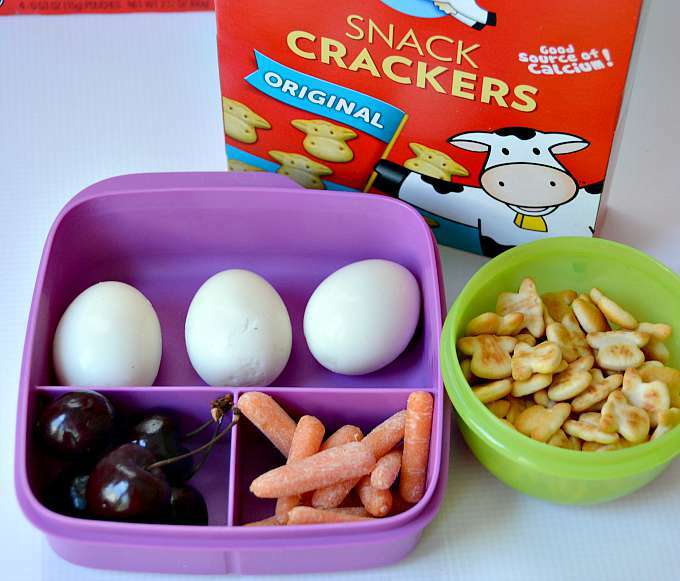 Packing a school lunch for picky eaters and getting frustrated? Me, too! 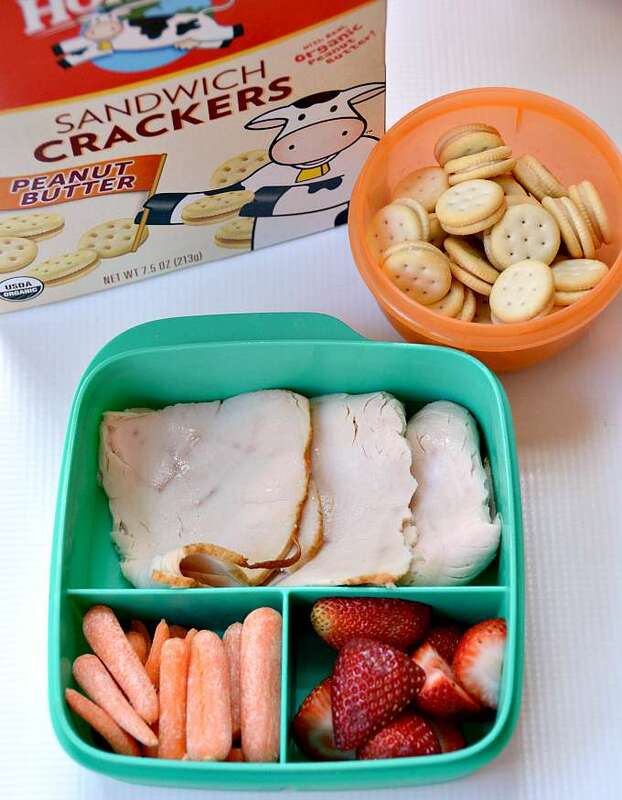 Check out these fun school lunch ideas that will have your picky eater asking for more. If you've read my blog a little then you may know that my 9 year old daughter is a very picky eater. I had no idea when I became a parent that I would spend so much time waging battles over food. It's exhausting. When my daughter went off to school three years ago, I dreaded packing her lunches. Eat lunch at school isn't an option because, guess what, she doesn't like school food. Shocker. So I was stuck trying to pack lunches that she would eat. The last thing I wanted was a hungry, cranky kid at school. I have been pleasantly surprised to discover that my daughter actually eats the lunches I pack. In fact, school lunch is the one meal a day I know she will actually eat. I take full advantage of that fact to pack her the healthiest lunch I can. I had to think beyond your basic sandwich, though, to finally find school lunches that worked for her. This is the lunch I started out packing. It's your basic lunch meat with a fruit and a vegetable (always carrots). Most of the time I give her ham because that's the meat she prefers, but I prefer turkey so that's what we had in the house. I pack her main lunch in these little multiple part containers. 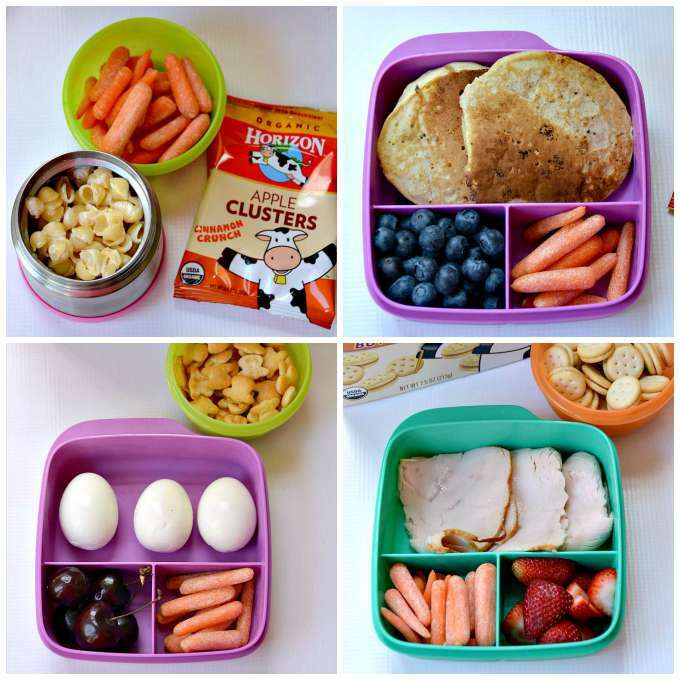 The one consistent thing you will notice with each of these lunches is baby carrots. They are the only vegetable she will eat in her lunch so she gets them every single day. But she eats them every day so I just go with it. I always include another separate container because her school allows a snack at their morning recess (we get three – we're lucky!). The snack changes daily. This year I stocked up on a bunch of new snacks from Horizon Organics. For this lunch I gave her peanut butter sandwich crackers. She'll get a little bit more protein and she loves crackers so I know she'll eat them. My kids love pancakes and will eat them for any meal. Whenever I make them for breakfast, I always make extra and freeze them. Then I can pull them out and send them for lunch. Of course, we have carrots, which is weird, but whatever, and blueberries. Mind you, if I put the blueberries in the pancakes, she wouldn't touch them. But on the side, they are perfect. For the snack, I added Horizon Organic's new fruit crunchers, which is basically dried fruit. This way she gets another fruit and she thinks it's a snack. You can do this with French toast, waffles, French toast sticks – just pack whatever your kid loves for breakfast. I picked up this cool little thermos to send in hot foods for lunch. Mac and cheese is a favorite as long as it's white cheddar cheese and shells. I'm not kidding. If it's elbow macaroni or an orange cheese forget it. She won't eat it. Thankfully, Horizon makes a great white cheddar and shells mac and cheese. Again, I make extra whenever I make mac and cheese. I just warm it up and put it in the thermos. We have the carrots in a separate container. I added the Horizon Fruit Crunchers to this meal as well for a little fruit. I've also packed just plain pasta (she won't eat anything on her pasta) and even leftover chicken in the thermos. So this lunch really surprised me and it goes to show that you just never know what your kids will eat. I made hard boiled eggs for Easter last year and my kids inhaled them. I have to hide the hard boiled eggs or they'd sit down and eat a dozen at a time. It's crazy! With the eggs, which I have to limit to 3, she gets fruit and veggies. 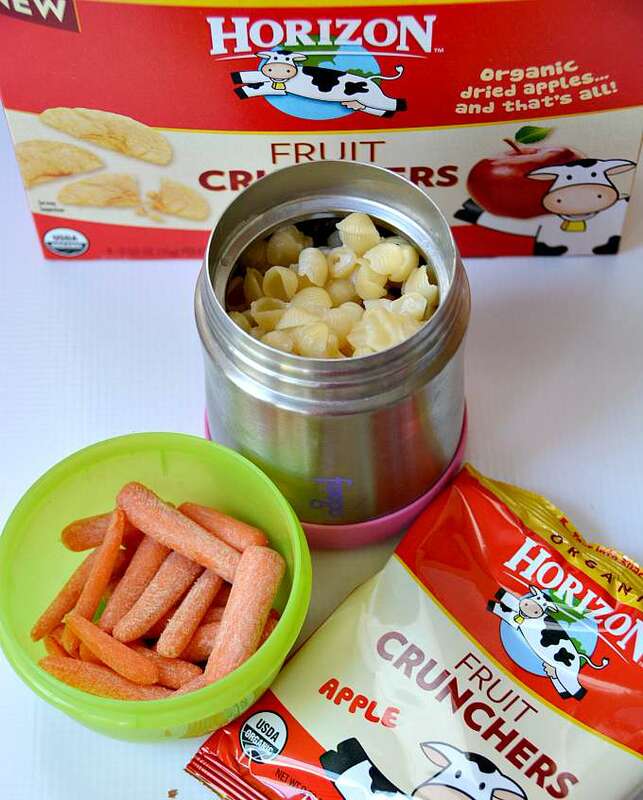 For her snack, I added Horizon Organic Original Snack Crackers. I limit cracker eating to lunch so my kids go crazy over these cows when they show up in their lunch bags. Having a picky eater can be extremely frustrating. But I've learned through trial and error some unique school lunch ideas for picky eaters. The key is to keep trying and thinking outside the sandwich bag. Include fun and delicious snacks that still make you feel good about providing them. You will have a picky eater with a full belly ready to learn. Where did you get the containers? This is so funny, my kid still won’t eat half of what you suggested and he’s 10. I feel like it’s a lost cause. Plain pasta in a Thermos?? 🙂 Mine is 10 now, too. We’ve made very little progress. She won’t touch a PB&J, but hard boiled eggs? Those are great! I’ll never understand! No plain pasta. Only freshly made Macaroni & Cheese (he knows if it’s reheated) and it has to be Kraft. He’ll actually make himself physically ill by refusing to eat, and honestly, cooking garbage is easier than cleaning up vomit. Thank you for this post for TRULY picky eaters. Several posts state that they are ideas for picky eaters, but my kids wouldn’t eat even HALF the foods they suggest! Thank you for keeping it real and for the great suggestions! I KNOW!! I can attest that these worked for at least a month each. But in the true fashion of picky eating, we had to move on. The current favorite is kiwi, which I then have to peel and slice every morning. But hey, she’s eating it! 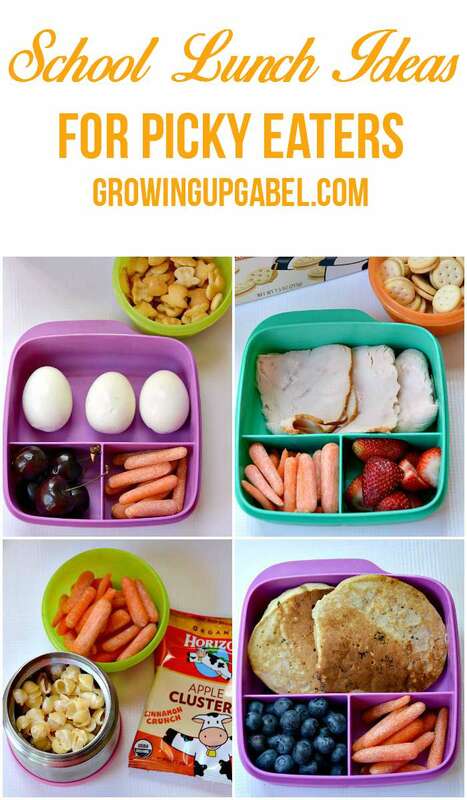 Great ideas for school lunches. Love all your ideas! The breakfast for lunch is a great one. 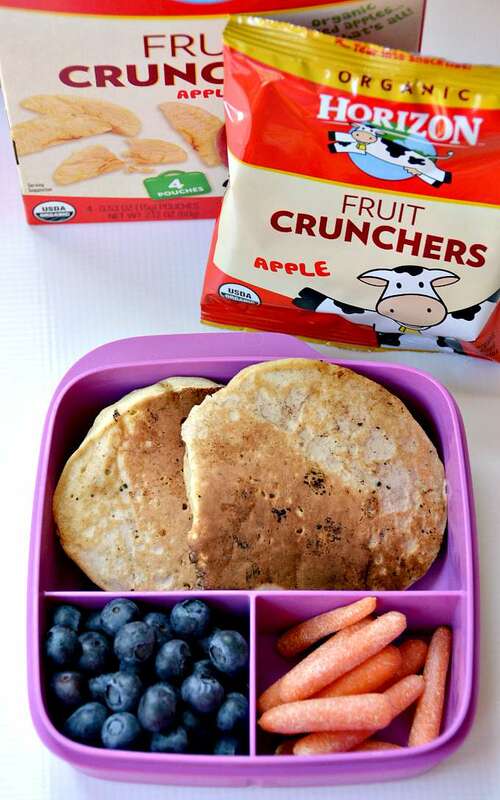 My son is totally a picky eater and he would love getting pancakes in his lunchbox. Thanks for joining the Family Joy Link Party! I’m good for about a month then I lose all inspiration. This year I might make it a week. What bento boxes are these? Hi Rachel! Those are Tupperware! I love them. They’ve had them available for the past 2 years in the fall for back to school. In fact, I love all of Tupperware’s lunch products. Check with a local consultant and let her or him know you’d like them when they come out. They may even have some on in stock.